Welcome to Sunday. We had a big BBQ yesterday and this post is scheduled so I will let you know how I am later. 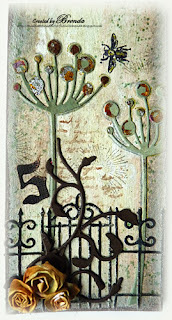 Today I am sharing my DT piece for Fashionable Stamping Challenges where the theme is inky and messy. Well I got messy with inks, paints, gilding flakes, embossing powder, glue - in fact you name it and it could be on here. I am also trying to use up scraps and left over pieces of chipboard hence the unusual shape of this. The background was layered with Eco-Friendly and Fresco Finish paints and heat dried, then edged with Crown chocolate suede paint. The next layers were Walnut Stain and Bundled Sage DIs followed by a wash of Picket Fence DS, both heat set. For the fourth layers I stamped the text and dots with Archival inks and then Fresco Finish painted die-cuts stuck over the top before misting with Blue Patina and Cappuccino Perfect Pearls. I painted the large butterfly wings in gold and added small book paper butterflies, finally I stamped the bees in black Archival and added some gold pen to their bodies and wings. I added gilding flakes to the flower heads and butterfly wings. To embellish it I made some rolled roses and sprayed hem with cosmic shimmer and used die cuts for the fence, gate and vine. Lastly I added some dark brown embossing powder round the edge. Well have a great day whatever you have planned and I will be back later with my PanPastel DT piece. What can I say except "Lovely". Can't wait to hear about your big BBQ, Brenda! This hanging is filled with warmth and beauty! Love the background and the butterfly with the gold gilding flakes is so dreamy! Beautiful! You always manage to come up with a unique piece of Art, and this piece is just wonderful, love all the painting and elements you have included it does not look busy but at the same time the design holds so much interest to the on-looker. Lovely piece, Brenda...with lots of different elements and wonderful techniques. Hope you had good weather for your BBQ. Another great make, love the background. And think the shape is fab! The colours are yummy and I love the butterflies too..trace x hope you had a great BBQ! Woooow, another amazing project - you've got such a magical touch, love the butterflies! Brenda this is beautiful, the soft colours definitely appeal to me. I am sure all the DT girls still have messy fingers. I cannot get the coffee stains removed from my finger nails - I look as though I smoke 50 a day when the reality is I don't smoke at all!! 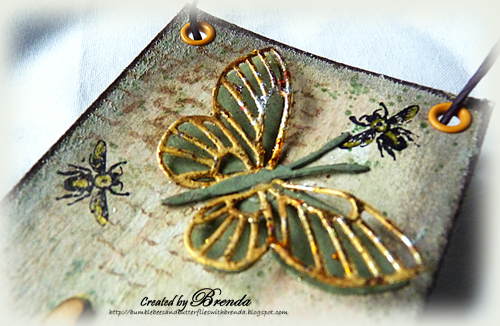 Very unusual Brenda love the use of the gilding flakes and the butterflies are gorgeous. Gorgeous piece. I love the background and details, the butterfly is fantastic. That's a fantastic hanging, great details. Hope you've had a wonderful BBQ. Hope you had a fab BBQ . I love love love this! The muted colours are so gorgeous, and the layers of paint, sprays, glues etc add up to a textured background to die for - butterflies are super too! I love that necessity (in the shape of the piece) has been the mother of such brilliant invention! This is gorgeous Brenda, Love the shape and the background. The butterflies have a beautiful finish to them. Hope you had a great BBQ. Also a masterpiece, the butterflies look as if they can fly away any second.. The butterflies look incredible... ready to take flight! Beautiful creation Brenda I do love how those gilding flakes transforms anything they are adhered to, I love this alot.